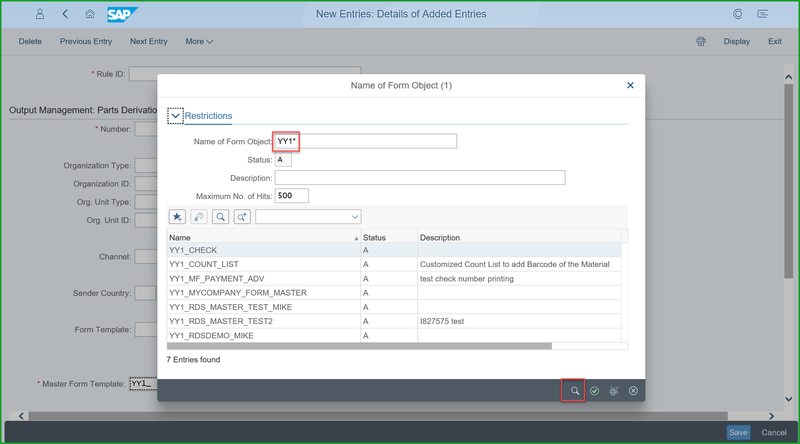 In SAP S/4HANA Cloud, Adobe forms (XFA) are the standard technology for rendering application objects (such as purchase orders, contracts, or invoices) into PDF format. Output management in the cloud provides the necessary framework for form template development and maintenance, data assembly, rendering, and output determination for forms. 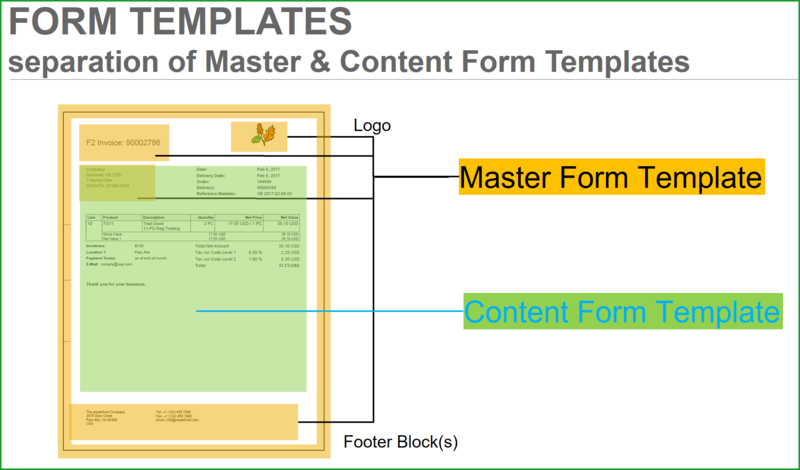 The form is separated into two parts Master Form Template & Content Form Template as shown in the graphic below. 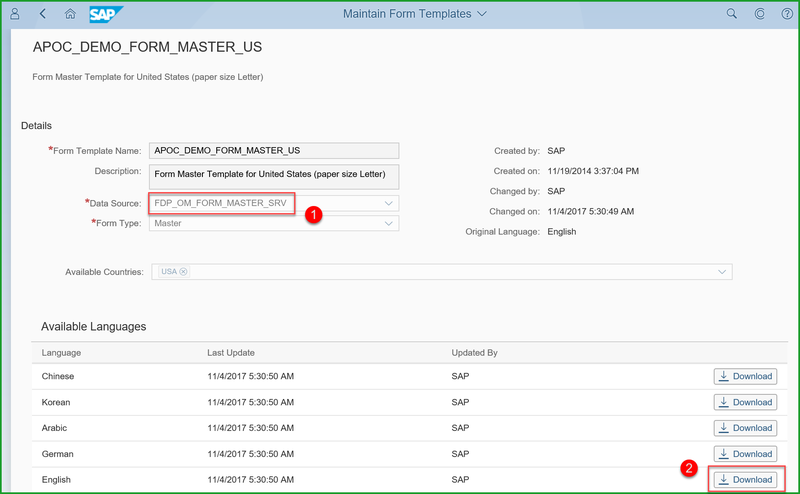 The blog shows how to customize the Master Form Template, shown here in black lines for logo & Footer Blocks – Address, Tel/Fax/eMail. There is a separate blog to customize Content Form Template which is shown in Blue arrow with shading in green. TIP: To check if printing is setup correctly the easiest way in case of ERP/S4HANA on-prem is to send screen printout to the printer, but with S/4HANA cloud will have to create any of the above documents and setup Output Determination, etc. Please note that you should download/modify/upload template in Q-System. After it is uploaded in Q, you can move across landscape using Q-System tile “Export Software Collection” and then import into P-System using tile “Import Software Collection”. Select Fiori app from Group – Additional Software, Fiori tile – Install Additional Software. You will require authorization with business role SAP_BR_ADMINISTRATOR business catalog SAP_CORE_BC_IAS. Click on Download for Adobe LiveCycle Designer. This is a 32-bit application that runs on both platforms 32-but as well as 64-bit. The system will prompt for S-User id login to the SAP Service Marketplace and your S-User id requires download authorization. Click on the (1) File and click (2) Save. Front End Installer is started, follow defaults to install software on desktop. 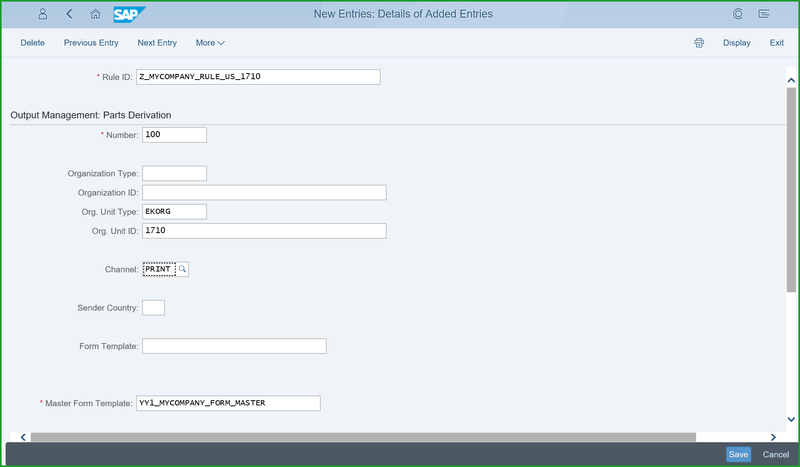 Select Fiori app from group – Output Management, Fiori tile – Maintain Form Templates. To easily select the template, please set filter as required – click on (1) Predelivered Templates, (2) Description as Master, (3) Available Languages as English, (4) Available Countries as USA, Click on (5) Go and (6) RightArrow to open the Master Template. Only one of them at a time can be referenced by the application form. 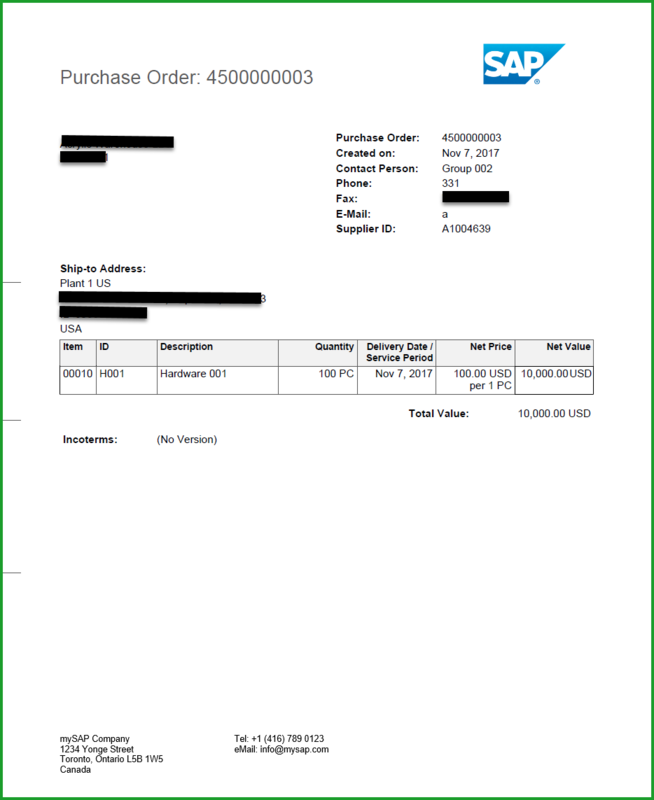 Purchase Order uses the last fragment above. Each fragment is designed for a specific page orientation (landscape or portrait) and layout variant (fact sheet, item list or outbound letter). Each fragment includes first page (mst1) and subsequent pages (mst2). Expand Portrait_OutboundLetter, click on imgLogo, tab Field and point URL to the logo file location on the desktop. In order to change Address, Tel/Fax/eMail you should select corresponding (1) txtLine and click on tab (2) Value to edit (3) Default. The figure shows the objects corresponding to the three footer boxs. TIP: Please note that in the Default text there is a "line feed" character between “The predefined Company” and “3475 Deer Creek” which you cannot see. Type the text as above and then paste it back into the formdesigner. Once you have all the details, click on Preview PDF to see the changes. You may have to edit this in Fragment Landscape_Factsheet to see the preview and then paste the same text over to Portrait_OutboundLetter. TIP: You should edit the same logo and footer text in the other fragments, (namely - Landscape_Factsheet, Landscape_ItemList, Portrait_Factsheet, Portrait_ItemList) as some of these may be used by other documents. For each of these fragments, change has to be made 2 times – under mst1 (first page) and then mst2 (Subsequent pages). There are 10 places to replace the logo and Footer boxes in the entire master template. 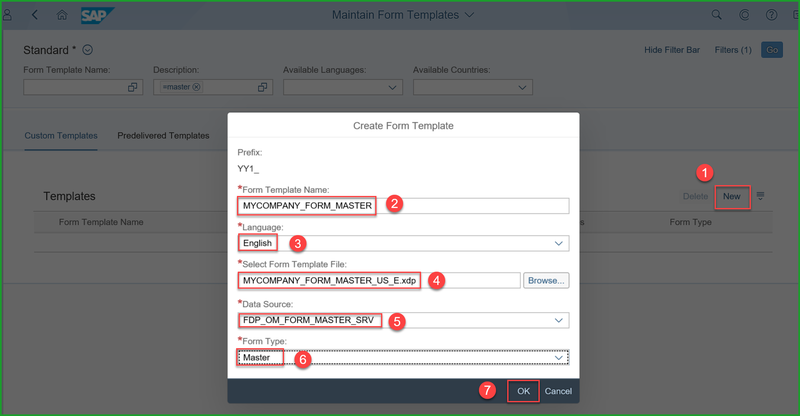 In Q System select the Fiori group – Output Management -Fiori tile Maintain Form Templates. The system uses the OData Service to access the custom form. Please pay special attention to select the correct Data Source. Click on New Entries. Enter Channel = PRINT. 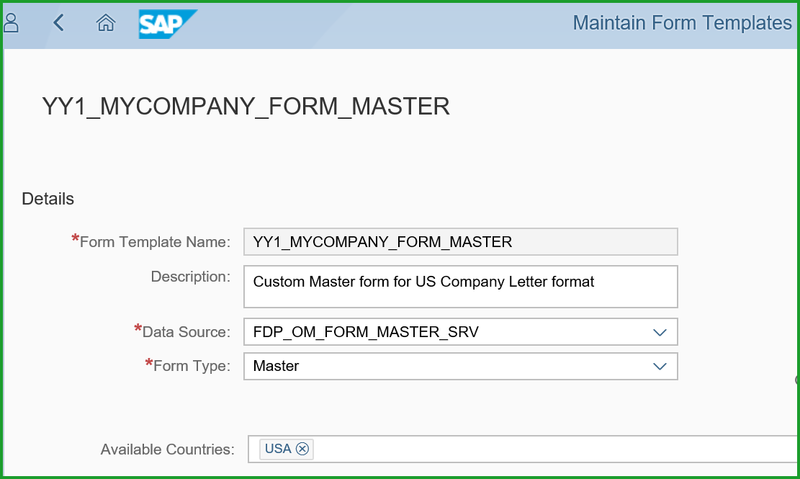 It is optional to restrict the form like shown below Org Unit Type = EKORG (= Purchasing Organization), Org Unit Id = 1710 if this form is meant for and select Master Form Template = YY1_MYCOMPANY_FORM_MASTER as shown below. If the system prompts for a transport, please create transport so that the changes are saved and will be available in Production system after Q2P transport. The Master form configuration is complete at this point. The steps below are to print a purchase order to check the master form is edited correctly. 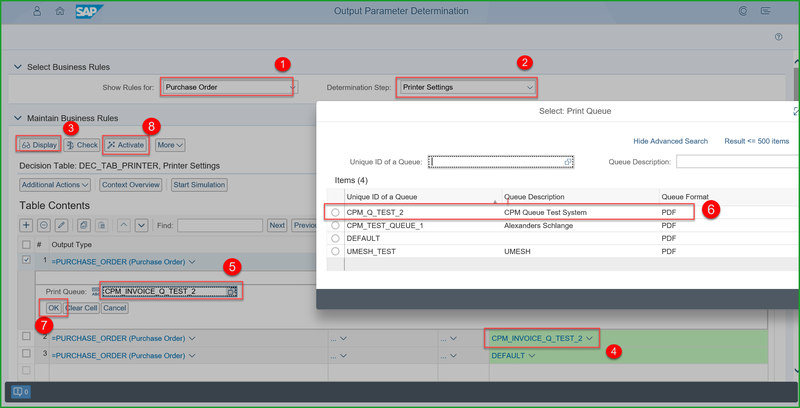 In Q System Select Fiori group – Output Control, Fiori tile Output Parameter Determination. You will require authorization with business role SAP_BR_ADMINISTRATOR business catalog SAP_CA_BC_OC. If not, click on (4) Edit and change the value to Immediately. Select Show Rules for (1) Purchase Order and Determination Step (2) Printer Settings Click on (3) Edit, select value under Column (4) Print Queue (scroll to the right) and click (5) popup to select the appropriate (Print Queue (6) and click on (7) OK. TIP: In the above screen please note there is always a Print Queue by name DEFAULT, but it cannot print to Cloud Print manager. The purpose of DEFAULT queue is for sending any output that does not have queue defined. Also please note that the Print Queues do not belong to a specific business user. 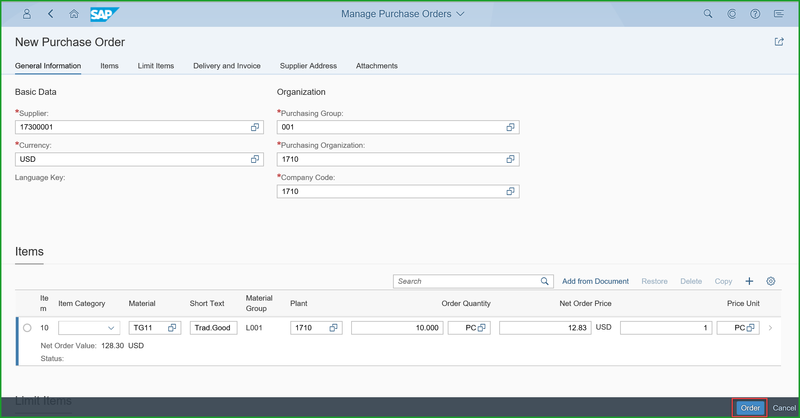 Select Fiori group – Purchase Order Processing, Fiori tile Manage Purchase Order. You will require authorization with business role SAP_BR_PURCHASER business catalog SAP_MM_BC_PO_PROCESS_PC. Select one record for Purchase Order. Please Note – if this is a new system, you will have to add necessary master data details to create new purchase order. Click on Order, two outputs are generated, eMail and Printout. Click on Preview icon to display the printout in PDF format. When you download a Content Form you may be prompted to download Master fragment. The purpose of this is so that you see the complete form and is provided just for maintaining the Content form offline. Do not move footer blocks into content area.